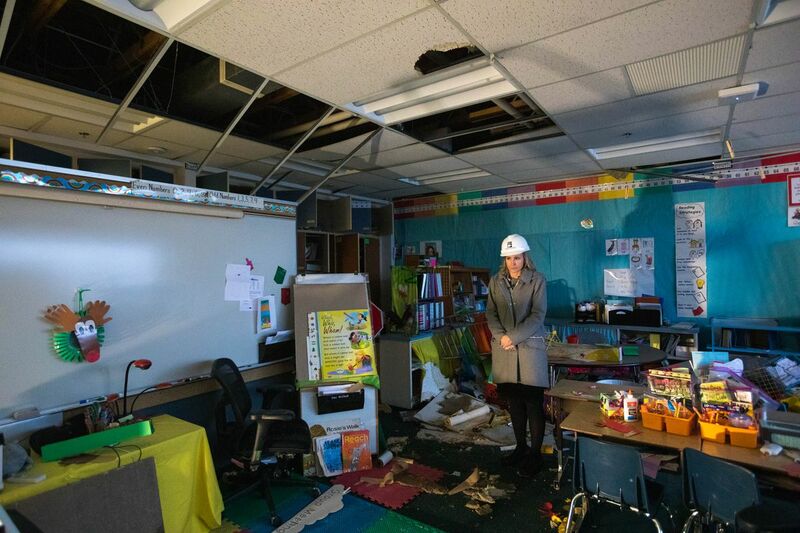 Gruening Middle School and Eagle River Elementary School will not reopen for the 2019-20 school year because of damage from the Nov. 30 earthquake, the Anchorage School District announced Tuesday night. Both schools were heavily damaged in the quake. District officials closed the schools for the remainder of the 2019-2020 school year, but left the door open to reopening in the fall. But new reports from structural engineers eliminated that possibility, the district said in a statement Tuesday. Students from Gruening Middle School will continue to attend classes within Chugiak High School, according to the ASD. “Feedback from staff and parents indicates that this arrangement appears to be working well and the District is fortunate that CHS can house the GMS program with limited and manageable impact,” said the statement from Superintendent Deena Bishop. Eagle River Elementary -- which housed an open optional program as well as a neighborhood program -- “presents a more complex problem," the district said. Tuesday’s announcement said no long-term plans have been made about the future of the damaged buildings.